On Friday, a 28-page text covering the main policy fields cursorily was published after a previous draft had been leaked. 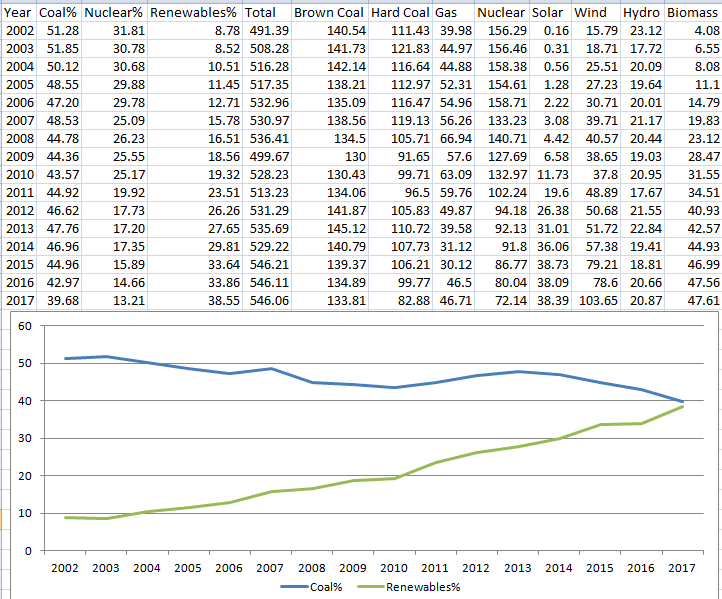 For energy policy, the changes are encouraging, but a lot of question marks remain. Perhaps because of the public backlash, the final version of the document (PDF in German) now reads, “We are committed to the climate targets for 2020, 2030, and 2050. We aim to close the gap towards reaching the 2020 target as quickly as possible, and we aim to reach the 2030 targets on time in any case.” The public debate now focuses on the leeway that “as quickly as possible” opens up. Indeed, the document raises as many questions as it answers. This change comes out of nowhere; I haven’t found anyone yet who saw this coming. The previous coalition of the same parties started switching to auctions in 2014 specifically to slow down the pace. It will be impossible to build more offshore wind by 2020, so it remains unclear what that passage means. Solar should be easy enough to build within that timeframe, which is more challenging for onshore wind, however. Perhaps the politicians hope that the large number of projects that lost in previous auction rounds can just reactivate their efforts so that projects can be completed on time. For coal power, the paper is both encouraging and uncommitted. On the one hand, 1.5 billion euros is to be set aside for structural change in coal regions. But no date is given for a coal phaseout. Rather, a commission on “growth, structural change, and jobs” consisting of “politicians, business people, environmental organizations, labor unions, and affected regions” shall propose a plan to “gradually reduce and end coal power.” Whatever date the commission proposes, it will only be a recommendation, which the government can still ignore. It’s also unusual for a commission to formulate such important policy details; usually, politicians want such high-visibility items for themselves – but this potato seems too hot. What’s missing from the list of proposed commission members is researchers and engineers. Someone needs to remind politicians that 65% renewable power – which will be 55% wind and solar in Germany – will practically mean the end of coal power by 2030 anyway. Rather than formulate a phaseout like the nuclear one, with specific deadlines for each reactor, the politicians apparently prefer to expand renewables (with priority dispatch!) so quickly that the market will become unprofitable for coal power, and companies will voluntarily shut down facilities. Mobility – an overlooked field – is dealt with 17 pages earlier under “infrastructure,” not under climate for the Energiewende. Expect this blind spot to persist. In the building sector, the paper vaguely commits itself to increasing the share of renewables, but no target is provided. Finally, it’s important to note that climate and energy take up only one of the document’s 28 pages, and the preamble mentions neither. Some press reports on the paper (like this one in German) don’t mention those topics either. It’s important for climate hawks to remember that issues like health insurance, the job market, immigration and the state social support system are bigger concerns for most people. New German coalition agreement allows 180,000-200,000 refugees to enter Germany each year … that’s 4 times the number Trump set for the US this year for a country with a population ¼ the size of US. On Sunday, 235 Social Democrat party delegates will vote on the proposed coalition agreement. If it passes, a grand coalition is likely. No other German party presents coalition agreements to a delegation for approval. Some Christian Union politicians have criticized the SPD’s policy, saying that they want to speak with negotiating partners who can actually make decisions. Thank goodness for our states, with actual targets and an effort to get to them. This just demonstrates how pathetic the Turnbull Government is. It’s Snowy 2.0…in maybe 5 years time…and nothing else from Two Tongues Turnbull. They might not quite reach their 2020 target but they made a pretty sterling effort. They did two main errors. They were overfocused on electricity generation and they did not have the balls to close the large part of the brown coal fleet which is now not necessary to have. Vattenfall sold their fleet for -400M Euros. Government could step in, buy them and do the step by step phaseout. These lignite power plants are worth very little, let them die-off. They’re still falling, 9 GW of state supported additionally wind and PV-power plus other REs and plus what was planned anyhow (4 – 5GW ?) until 2020 are a big blow to an already oversupplied market. Since most of the planned additional 4 GW on-shore windpower will be placed into lignite areas in Eastern Germany and have grid access priority the lignite power plants there are practically done. Let there be a new CO2 tax as planned by the EU (the UK has about £17.-/tonne?) and they’re gone within 3 years. That speaks for a quick end. The reason for the lignite sell off is for windfall profits in about 2020. When the next nuclear plant closes coal demand will rise sharply, and spot prices for dispatchable power will skyrocket. Germany will increase carbon emissions by double digit percentages. As the power exchange can tell you the power prices are dropping, there zero buyers interested in power for 2022(the end of the atom exit phase) and zero buyers for 2023. The kick-down is observed from the 8th of January. As you can see there is zero money being made with power contracts for 2022, 2023,2024 base load. No one buys electricity futures when price reductions are expected. And this is the case for the time after the atom exit, after 2021. Germany will have so much (RE) generation capacity installed by then that only fast reacting fossil power plants are expected to have a chance to deliver any significant quantities, a profit is not expected for them either. Hence the call for capacity mechanisms. The new owners of Vattenfall’s Eastern Germany’s lignite assets were paid to take them with over € 2 biilion. EPH brought NO money to pay for the mines but GOT money. This money was then used to pay debts of EPH, channelled out of the Eastern German lignite assets. EPH is a locust . There is now no money left to clear up the Swedish-Czech mess like for re-cultivation costs, social cost and so on. Vattenfall’s € 2 billion are gone, they were demanded legally by the German state to be set aside to pay for liabilities. These € 2 billions were the only reason why EPH (a one-man fantasy company based in some tax haven with no fixed abode) bought the brown shite. Sure the state has now to pay for extra police forces, prisons, social welfare to keep the Eastern German Nazis down, poverty and ignorance in the lignite areas is their base. The atom exit was announced in 2000, any speculator beside EPH knows about it. But EPH was the only one who showed any interest, the 2 Mafiosi behind it were calculating for an early death of them self and time purchaseable via lawyers, legal tricks. And took the risk of ending up behind bars. The Swedish state could not find any other buyer. I hope so. Expect fierce resistance from my home regulatory captured CZ. “What is good for ČEZ and EPH is good for the country.” This is a stance of our Ministry of Industry and Trade. Similar in Poland. A sad story, we see the same rubbish being published by German politicians.